PC users, here comes another guide as promised earlier. 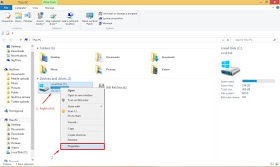 This particular guide will see you through on how to remove the "windows.old" folder if you upgraded to the recent version of windows, that is, windows 10 without formatting the Hard Disk Drive first. The creation of this Windows.old folder is as a result of updating your old version of windows to Windows 10, without it under going the process of formatting, and because of that, the installation wizard now create this aformentioned folder (Windows.old.) This said folder contains the old files of the previous version of any windows you must have used. Although, "windows.old folder" makes it possible for one to rivert to its previous used version of windows, at any point in time. But the negative aspect of this folder, is that, it consumes a lot of space on the memory of your PC's hard disk drive. The memory it consumes is in Gigabyte and not in megabyte. So, that should tell you how much space it consumes. Are you okay with Windows 10 OS having it installed on your PC, then there is no need of leaving behind this windows.old folder that consumes much space. Now, let's get rid of it from your Hard Disk Drive, in order to free up your memory. Below steps will guide you properly. 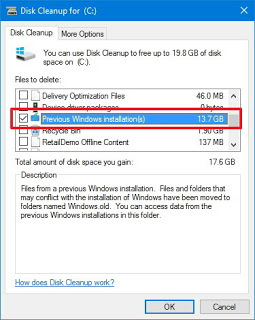 SIMPLIFIED AND PROPER STEPS TO REMOVE "WINDOWS.OLD" FOLDER FROM YOUR RECENT UPDATED OS "WINDOWS 10"
You might say "Windows.old" folder is just an ordinary folder that only contains files in it, so you can highlight and delete it from your Hard Disk Drive without stress. But NO to that, the proper way of deleting it from your hard disk drive, is with Disk cean up tool in order to avoid crash. So below is how to use this tool for proper removal. ==> check on the right pane, just below Divices and Drives, now, right click the Local Disc (C:) and choose properties as shown in the below screenshot. Towards the bottom of the window, click on Cleanup System Files. ==>Next, you will have to click on radio button so as to delete the windows.old file from your Hard disk. 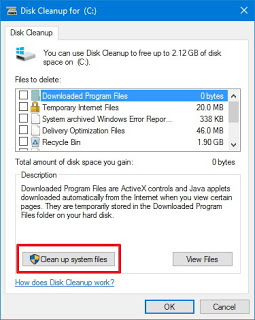 This very action will make the previous windows installation you used before this present one, delete the folder properly. That was what happened when you clicked on radio button. ==>Finally, click on "YES" to confirm the clean-up process. That's all for that. Happy free space free up! Got any contribution for this post, kindly use the comment box for that. Don't forget to share to friends using the social buttons below. Thanks.